Kargil: Whose War was That? July 26 marks 10 years after India won the limited but high-stakes Kargil War initiated by Pakistan. On this day in 1999, the Indian soldiers gave the country a significant victory - albeit at a heavy cost in life, limb and blood. 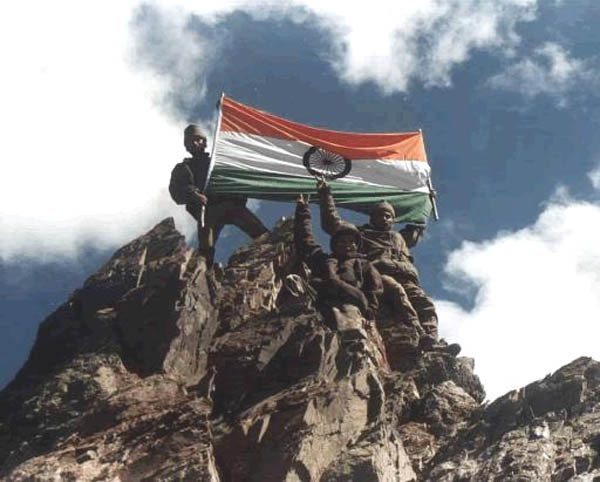 More than 500 military personnel gave their lives and a grateful nation celebrated a Kargil Diwas (Day). But regrettably a decade later, it is evident that the nation has learnt little by way of imbibing the right lessons. And this is not for lack of clear and objective recommendations based on a careful review of what caused Kargil and what went wrong as far as national security was concerned. The Kargil Review Committee headed by veteran security analyst K. Subrahmanyam produced its report in record time and this was submitted to the Atal Bihari Vajpayee-led NDA government. To its limited credit, the NDA constituted four separate task forces to make tangible recommendations to improve and restructure the following areas: management of the country's borders; internal security; intelligence gathering capabilities; and defence management. These reports were then submitted to the NDA government and reviewed by a Group of Ministers. The earnest hope and crying national need was for these recommendations to have been discussed in some detail in parliament so as to obtain consensual political support and then be implemented progressively. The objective ought to have been to prevent another Kargil and create necessary national security capacity from the apex downwards. Alas, little of the implementation took place during the NDA rule and even less so in the UPA's first tenure. Consequently the nation had to face the ignominy of its parliament being attacked by terrorists in December 2001 and seven years later, undergo the trauma of the November 2008 Mumbai attacks - a veritable maritime Kargil. In the interim, national security has become a political football and it was deplorable that in the run up to the 10th anniversary of the Kargil Diwas, some political representatives actually described this war as belonging to the NDA/BJP. The martyrs and their families and those wounded in the icy heights of the Kargil-Drass region have been predictably forgotten and ignored. The lack of adequate capacity for national security - despite the rhetoric that is periodically heard - is best reflected in the kind of time and attention paid to this highest and most sacred national calling in the Indian parliament. In 10 years, there has been no sustained or meaningful debate on the Kargil war and its lessons in any session of parliament. And to add insult to injury, in the same period, the Ministry of Defence has returned almost Rs.50,000 crore (over $10 billion) as money unspent from the amount allocated for acquisition and modernization of the Indian military inventory. Thus the reality is that in the post-Kargil decade, India's trans-border military capacity has shrunk - but no one in the political spectrum is particularly concerned. In this period, the nature of the security challenges facing India has become more complex and tangled and today the external and internal security strands have coalesced into one opaque domain. The country is at war. On paper - in the budget documents - the country allocates over Rs.141,000 crore (nearly $30 billion) towards defence. Yet what is meaningfully spent is lesser and this when the military, para-military and police forces have equipment and related inventory that is veering towards block obsolescence. Parliamentarians and senior political leaders must take the responsibility for this sorry state of affairs and embark on appropriate redress with purpose. Specific suggestions include convening a full 10-day session of both the houses that will discuss the Kargil recommendations and the GoM reports to evolve an all-party consensus for immediate action. The Indian military is a credible and highly professional institution and when the chips are down - as they were in Kargil in 1999 - it was the young officers and their committed troops who plucked the chestnuts out of the fire. Ineptitude at the higher levels of national security management is a recurring leit motif from the 1962 war with China through Kargil to the 2008 Mumbai carnage. Many inadequacies exist in the Indian national security apparatus despite the lessons of Kargil and this is a poor reflection on the Indian entity - both state and empowered civil society. Parliament ought to demand that the government set up a Blue Ribbon commission that will draw the most eminent and capable national security professionals who have no political axe to grind to carry out an urgent review and outline time-bound remedial measures. And to be meaningful and not anodyne, they would have to be radical and far-reaching and not timid and tentative. Finally, as regards the martyrs - those who died in Kargil for flag and country - and the many more who made the supreme sacrifice before 1999 and after - right into July this year - they warrant a national tribute. This is not the time to open the arid debate about why the world's largest democracy does not have a national memorial for its 'fauj' but to make a modest suggestion. Many Western nations who lost their young men in World War I (which incidentally includes India) mark Nov 11 as Poppy Day. A tradition has evolved wherein the common citizen lays a poppy flower on the tomb of the martyrs or pays tribute in a designated public space. The average Indian need not wait for the state and its political representatives to decide whose war Kargil was. It was fought for India. Period. Thus there may be a case to choose an Indian flower - why not the humble 'gainda' (marigold) - and offer it to the unknown and forgotten Indian martyr who willingly shed blood. Local communities can decide how best to remember the martyrs and their families in their midst and let them know that at least once a year. 'Your sacrifice is not forgotten'. The moment has come for 'Gainda' Day to lead the plethora of other dedicated 'days' that dot the Indian calendar.